oonaballoona™ | by marcy harriell: To the Veteran I Never Knew. Granddad served in the South Pacific, but whenever they were docked stateside, Nana would go to visit him on his ship. His crew mates were incensed that a Black man was involved with a woman who, by all appearances, seemed White. They had to assure them that she was not. He was incredibly hard working. He had multiple side jobs on top of his full time job at Western Electric, which he got because he was a veteran, in spite of the color of his skin. One hot summer day, the young family of four all got on the bus to Olympic Park in Irvington, NJ. They were excited to ride the roller coaster and cool off in the pool. But when they arrived at the gate, they were denied entry because of the color of their skin. This might seem like a story about race. It's not-- but it is. I said at the beginning of this lengthy post that I believed my Granddad didn't love me. I suppose I should tell you why. My extended family looked like a Colors of Benetton ad, but it sure didn't act United. 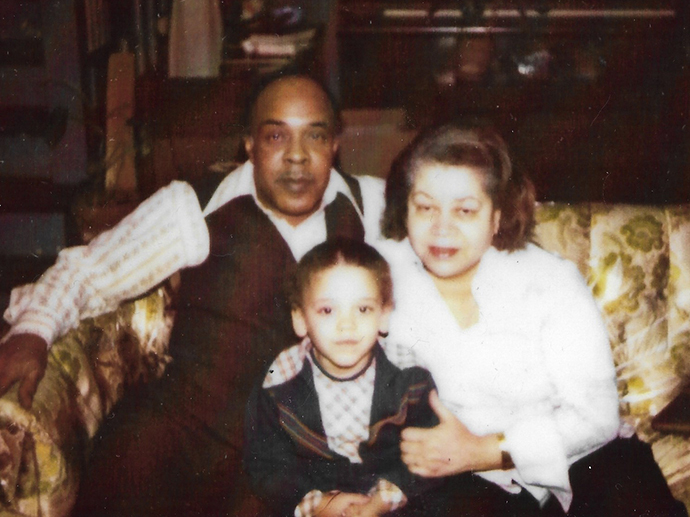 We were opinionated, and funny, and loud, and passionate, and ever-slightly-feuding--and though every single person in that house was born of a mixed race marriage, a lot of those holiday feuds were centered on race. What race you were, what race you claimed, what race was better than the other. Neither of my grandparents ever joined in these conversations, especially my Granddad, who sat downstairs as the hollering went on. His silence made it easy for me to believe he didn't care enough to talk. 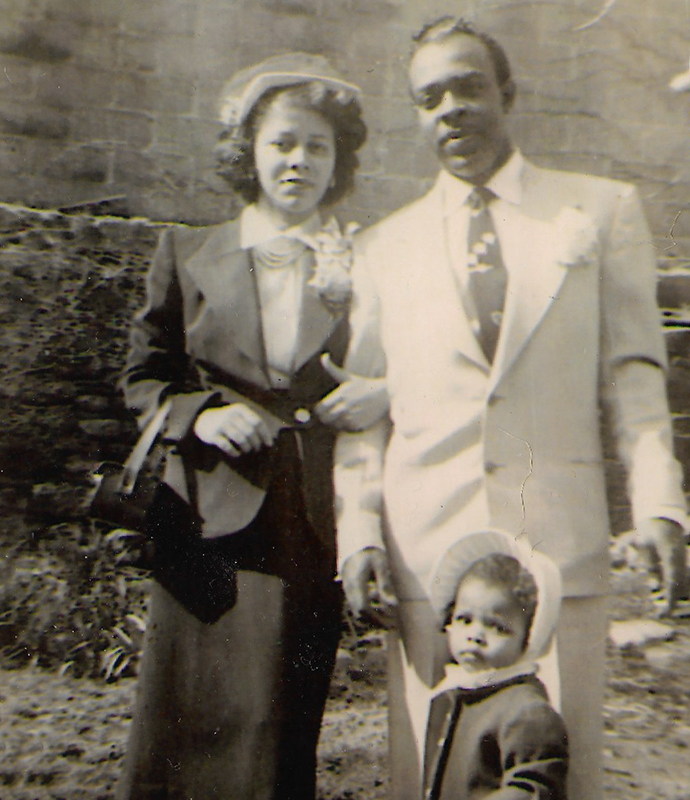 I believed my particular racial blend held both of my maternal grandparent's love for me at a quiet arm's length. We all have strangers in our lives: neighbors who vote the other way, family members we just don't get, countless people we only know through half-thought-out opinions on social media. In honor of this man I didn't know--this man, who by sheer virtue of the magnificent daughter he raised, was obviously a man who had great love inside him--in honor of this man, I'm going to do my best to question my beliefs. To hear a siren and consider that it might mean help is on the way for someone. To consider that a stranger's sideways glance might not be condemnation--maybe it's a commendation on my latest oona creation. To let my beliefs be pliable enough that I can give small and large kindnesses to those that I see every day, and those that I'll never see again. That sure is food for thought! I"m glad those family stories finally came out, and glad you can rewrite your family narrative in your head to better understand your grandparents. Thank you do much for this post. For the last couple of days I've been sad and afraid, but I've also been examining my own behavior and the stories I tell about the world. I feel like in order to move forward in a positive way, I need to access those deep reservoirs of love and compassion, and try to understand the fear that drives people to make seemingly uncomprehensible decisions. I'm so so grateful for voices like yours, speaking with nuance and self-reflection. It gives me hope that we can come together and stand strong for each other. thank you, craft quest. It is so good to hear that-- I believe examining ourselves and going out into the world with empathy and compassion is so important. Thank you for doing that! A wonderfully emotional post. It's a good thing when some of our beliefs change, I am certain that it means growth. This is the attitude to have. My grown son wrote a beautiful Facebook post which he titled "We are our own saviors." His point was that each of us has it in herself or himself to help another person, even if in only a small way. It's hard to know where our country will be going the next few years, and we will have to depend on one another to get through it. That's a wonderful statement. I was talking to Rob about wanting to make change by doing the things we can, which may end up being small. Lots of people, though, doing lots of small things...adds up. Would love to read his post if you feel okay sharing the link. My Father was a man like your Grandfather. Very little to say and little interest in the tribulations around him. I used to think he just didn't care. I learned after much soul searching and revelations that he may have been the only person in my family that truly loved me unconditionally. Thank you for the post. It reminds us all to question what we "know". I love hearing the stories of your family, and this is a great one. Your grandfather reminds me of both of mine---stoic, reserved men, not prone to displays of affection. (For that matter my father is not much different.) I don't know if we ever had a real conversation, even with my mom's father, who lived to see both his great grandchildren. I wonder if that was just the nature of being a man in many cultures back then---cutting off large portions of your humanity in the name of being strong, stoic, a provider... I'm sure hardship didn't help. I'm so glad your parents, at least, were able to share these stories with you. You know, I think you're right about the time that they lived in shaping their stoicism, of course!! Rob's grandfather was the same way, and the little things we found out that he said about us, after he passed, were so surprising. They were the only grandfathers I knew, and now that you mention it, they were like two sides of a coin. Maybe you can surprise your Dad with some history questions? Bless you for your good heart. Am I the only one who thinks you are the very image of your grandmother? Thank you :). And yes, several people have mentioned it, though to be honest I never saw it until today. I always saw my mom in that snapshot! I'm glad to be a little part of the puzzle-- that's so well put. Beautifully written and poignant, thanks for sharing. A nice way to move forward in this turbulent world. The family stories never told or barely examined too often define our lives--in not so good ways. How great for you that there are still family members around who can put your long held thoughts into perspective and change your definition of a grandfather's love. So many men of your grandfather's generation were stoics who rarely had anything to say at family gatherings. As a child, it would have been difficult for you to understand his silence as anything but disregard. But, instead, as you have learned, he cared deeply about you, even in his silence. Always a good idea to test our assumptions now and again. Sometimes the result is a gift. Very interesting post. I can only imagine how it affects you to be treated differently because of the color of your skin. My grandads were were in the world war II as well. I only really got to know my father's dad. I feel tha the war had influenced a great deal on who he was and how he saw life. I've heard from more than a few people that serving in the military changed how they saw race, in a positive way. It introduced them to people they never would have met, and more than that, they had to survive together. What a wonderful perspective! And a gift to finally hear stories of your grandpa. This is really beautiful and what I needed to read today. Thank you. I too had a stoic grandfather. He never said much, unless I asked him about his rocks (he was a rockhound, and an amateur jeweler). He was always happy to tell me what such-and-such a rock was, but that was the limit of our conversations. I went to college near my grandparents' home. By then my grandfather was quite sick with multiple myeloma. I saw my grandmother a lot, but Grandpa rarely left the house. I had to have my face reconstructed my freshman year (it's a long story), and the first step was pulling quite a lot of teeth. They had to put me under, so my grandmother came to drive. She didn't want me staying in the dorms while I was recovering, so she brought me home with her. The anesthesia was making me feel pretty cruddy, and I was laying in the couch in the basement. My grandfather (he too had a basement recliner) was down there too, and as the fog wore off, I started to think that he was probably ruminating on what a wuss I was. He had had more operations by that time than I could keep track of. I tried to be unobtrusive, but I must have moaned of something, because I saw him turn to look at me. He just nodded, and said, "It'll feel better in about two more hours," and went back to watching TV. I realized that he wasn't down there being irritated with me. He was down there to keep an eye on me and make sure I was okay. He didn't think I was a wuss, he sympathized. 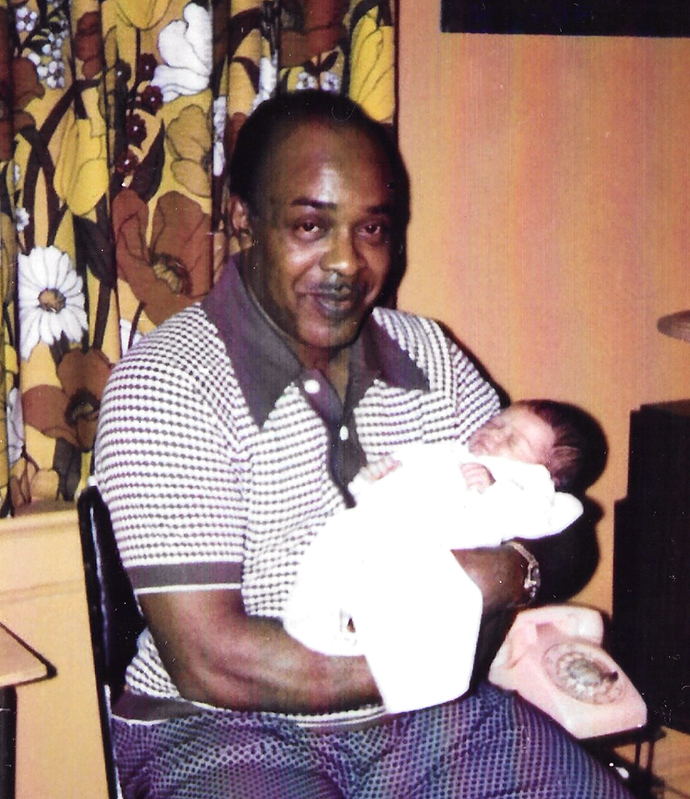 He was an amazing grandfather, and I didn't even know it. That's when I started learning to question my judgements of other people. Sorry for the novel! You just got me thinking. Denise, thank you for sharing that absolutely beautiful story! I can just see your grandfather keeping quiet guard. How wonderful that you had them both during that time. Ok. So I didn't expect tears to come but they did. Beautiful post Marci. Marci....I want to hug you. That's an awesome post. One of the most self-aware things I've read all week. Thanks for risking it. It was worth it. ah! When a sideways glance from a sarcastic woman is actually the highest praise! Missed conversations are up in the top five for regrets, aren't they? But how great that you can look back over all those beliefs and see them in a new way. Wow! The best post I have read from anyone ever. And brought back memories of my Granddad who was pretty formidable. I found your words particularly moving and powerful, because you focused on examining yourself, your mistaken beliefs, and how you might change, rather than on what is wrong with other people. If we all did that, I have no doubt but that the world would be a better place, beginning at that moment. We should all stop imputing negative feelings and motives onto the people with whom we disagree, and endeavor to understand another perspective. It's so hard to look at ourselves when each of us is so sure we're right. Hard work ahead of us all, but I agree, it might get easier if we start with ourselves. Thank you. For sharing, for being willing. You are truly a beautiful person, Marci. My great grandma died when I was 12. She was always mean to me; I figured she preferred my brother. My aunt told me once that Grandma didn't like little girls, she only liked boys, and she was always nicer to my dad when they were children too. Later I found out, I don't even remember how, that my Grandma had three daughters, and a son, who died. She never got over the loss, and perhaps she resented them for living instead of her golden boy. So my dad was a golden boy, my brother was a golden boy, and the girls fought for the scraps. Three years ago, my second child, my infant daughter, died at only a week old. I remembered my grandma, long dead now, and wondered if I would go that way, and it gave me tiny, tiny insights into her broken heart. Perhaps she was too afraid to love anyone else. Perhaps she loved us and was too afraid to say. For almost every friend's pregnancy, I wonder why their child lives, and my child died. For me, I put aside that thought, as best I can, but perhaps Grandma couldn't. I'll never know. That is at once so heartbreaking, and so beautiful, that you gained that insight from such a terrible loss. Thank you, so much, for sharing that. That was beautiful, Marcy. Thank you for writing this. My grandpa and I had the same relationship, and I was even a little frightened of him, because he didn't speak very much. The only talking I heard him do was when he and my grandmother would fight rather loudly (they were Italian, and tended to be a little loud when disagreeing with eachother). Other than that, he would sit and stare out of their apartment window. He lost one of his fingers when he worked in a factory. I never had the courage to ask about it. Also, I was born in Irvington. Spent a bit of the 70's there going to school and we ended up moving to the next town over, when I was 8. My grandparents continued to live there, though. My other half is Italian (well, not half, I have no idea what the percentages are ;), and we were/are a loud bunch too! Very small world. I wonder if you could ask anyone for the story now? That's exactly what I'm hoping for--a big thing has happened; the small things may be the only and best thing we can do right now. Ones belief is not always truth! Should be a billboard! Some of the best times I had as a child was with my grandparents. But you are not alone in your outlook, my sisters were the same way. I am gald that you are trying to see things in a different light. There are always things to learn. When we stop learning we stop growing as a person. It is always good to ask questions. Your post was just what I needed to read after this tumultuous week of political upsets. Thank you for taking the time to share this story. Here is hoping your words will reach many. Amazing story. It's a book waiting to be written. Poignant, beautiful and touching. Thank you for sharing. As the daughter of a mixed race marriage, where my father was a decorated army vet, I found so many similarities in the twists and turns of your life. What a comfort to read. What a wonderful love filled story. And I too try to remember my stories are not reality most of the time. Love is about the only truth that lasts. I wish I could adequately express my thoughts on your post. Just wow! And thank you. People like you will help us through this mess that we're in. Having conversations with love and respect on both sides is exactly what is needed, and wanted, by so many people right now. Thank you for being you and sharing your story. I love you and I need your love. Thank you for your thoughtful post! I've thought so much in the last few days about how we Americans allow ourselves to be manipulated by others with their self-serving agendas. I'm struggling to understand my own biases and lack of knowledge and understanding. I'm deeply disturbed by people who look down on Trump supporters for being ignorant. Hey, we are all ignorant. His presidency horrifies me, but I refuse to demonize the bulk of his supporters who are ordinary working class people struggling to survive. But I will NOT tolerate any attacks from any of them! I enjoyed your article. I am constantly having to question my perceptions. I find I usually assume the worst, but I am working on it. Thank you to your grandfather who fought for our freedom! A superb post. I didn't realize the extent of prejudice until I lived in CA and had all friends of color - happened naturally there. But their real stories outraged me and made me sad at the same time. I learned slit from those dear girls. And you today. Thank you. Thank you so much for this great post. I have been deeply disturbed by the outcome of the election and some of the reactions, some of the things that have been going on in the world this week. I dread Thanksgiving. I usually love it when all the family gets together. We always get along so well but they're mostly conservatives and if the subject of politics comes up I think I might cry. Martin Luther taught an interpretation of one of the Commandments, the 'do not bear false witness' one, that went something like this: "Believe the best of people. At first glance, you usually don't know that they don't mean well, and to interpret otherwise is to bear false witness about them to yourself." Thank you for sharing this! It gives me hope after this crazy week. He might be the bringer of change after all if we all start to examine and question ourselves like this. Family histories can be fascinating, and yours is. Thank you so much for sharing it with us! We live in interesting times. Let's all work together to make certain that they remain merely interesting, and do not turn into terrifying. Thanks for sharing Marcy. That was the blog post equivalent of a little book I couldn't put down. Also, "My beliefs became truths that made no room". I love that line so much. The butterfly effect. One little act is all it takes to make the world a better place. Really enjoyed reading your post. Your Grandfather spent 4 years in the Pacific in WWII! So did my dad and two uncles. They all came back changed men... quiet but always alert and watchful. Other than immediate family, they had become loners. They never wanted to talk about their war experiences but some of the details came out when ex unit buddies began searching them out 30+ years later. If you can find out the names of the ships he served on you might be able to put together more info about your grandfather's experiences. It may explain his self isolation on a chair in a basement. Hi Marcy, it's Aunt Pat. I just read your blog about Granddad, my father and wanted to reach out. The man you knew loved you and all of us, but he was shaped by an America hostile to Black men. That caused his stoicism, but he never responded with the hostility he faced. He and Nanny ( my mom) never let race affect them. They did not discuss it. I did, though, a lot. That's what you remember. Granddad and Nanny were severely traumatized by my sister Linda's death, they never got over it and retreated into their shells. That's what you saw. Your mixed heritage was not an issue, my twins were of mixed heritage too, my parents accepted that. I am sorry you did not know him as well as the older grandchildren and his nieces. They thought of him as cool and loved spending time with him. Frank Weston showed me what a man should be. Strong, supportive and warm. I miss my parents and am thankful for the life they gave me. Granddad felt he should have been able to save Linda, he prayed for God to take him and not her. When that did not happen, he retreated. Such an important post for you and your family. So interesting to read from an outsider's point of view.. but the line that will stick with me is: 'My beliefs became truths that made no room.' Thank you for helping me to reflect on this for myself. It is obvious to see in the photo that your Grandfather adored you. The love shines though. Look at the photo, then take a moment, close your eyes and picture yourself within that strong but tender embrace. He was proud of you.